This striking Art Deco bookplate entitled “Creation” and used by a certain David Adams is by Chicago-born Lynd Ward (1905 – 1985), the American artist and illustrator best known for his wood engraving and his work in launching the graphic novel in the United States. 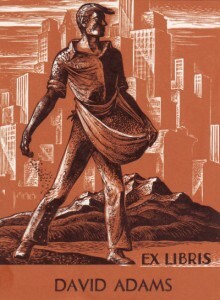 Ward published six graphic novels starting with the Art Deco and Expressionist-inspired Gods' Man, which was released the week of the 1929 stock market crash, and went on to influence generations of artists in all fields including the Beat Generation poet Allen Ginsberg. His final graphic novel Vertigo was published in 1937 and he left one more incomplete wordless novel at the time of his death. This particular ex libris is pasted into a 1931 First American Edition of The Waves by Virginia Woolf, published by Harcourt, Brace and Company. This entry was posted in Ex Libris Et Cetera and tagged American Ex Libris, Art Deco, Bookplate Designer, Lynd Ward. Bookmark the permalink.